This recipe is inspired by the three-star chef Georges Blanc, who prepared a French-style Thanksgiving dinner that I attended a couple of years ago. He was kind enough to share some details of his preparation of the turkey, which is stuffed with ground meat, walnuts and thyme instead of the more traditional bread stuffing with chestnuts and sage. Turkeys sold in France are generally smaller than those in the United States, and they are most often free-range birds. 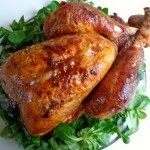 This enhances the quality of the meat and shortens the cooking time. Try to find a free-range turkey if at all possible. 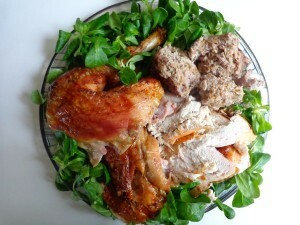 If using a larger turkey than the size specified below, you will need to adjust the other ingredients proportionally. Cooking time in this recipe totals 2-1/2 hours for an 8-pound bird, and the turkey will feed about 10 people. 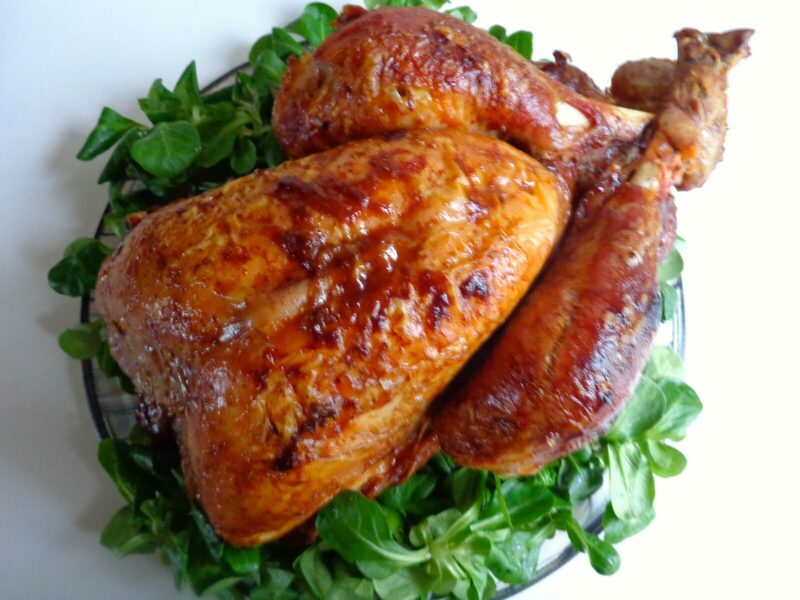 If using a larger bird, increase the cooking time by 20 minutes per extra pound, or 40 minutes per extra kilo. In any event, remove the turkey from your fridge a couple of hours before you plan to roast it to allow it to return to room temperature. As for the stuffing, make sure the meat contains enough fat. My butcher recommends fat content of about 30 percent to ensure that the stuffing does not come out dry. Spooning a little gravy over the stuffing before serving will ensure that it is moist. Serve the turkey with an assortment of vegetables. I served the turkey shown in the photo with roasted figs (drizzle fresh figs with a little olive oil and roast them for about 45 minutes) and braised finocchio (use the recipe on this site for braised finocchio and Belgian endive, and omit the endive). Another interesting option could be pumpkin gratin, also a recipe inspired by Georges Blanc. Or stick to your favorite holiday veggies. Begin by making the chicken broth. This may be done a day ahead of time. I highly recommend making your own broth and avoiding bouillon cubes. Prepare the stuffing: Combine the ground pork and veal in a large bowl. Peel the garlic and put it through a press into the bowl. Add the thyme leaves. Crush the walnuts with your hands (do not grind, as the pieces would be too small). Measure and add to the bowl. Add the salt and grind in some black pepper. Pack the stuffing into the cavity of the turkey. Bind the bird up with string, tying the legs together tightly and tucking up the tail to close off the opening as much as possible. Click here for a video showing how to do this. Use 1 tbsp. olive oil to coat the bottom and sides of your roasting pan. Coat the turkey with the other 1 tbsp. olive oil. This is most easily done with your hands, although you could also use a pastry brush. Place the turkey in the roasting pan on its side so that it is resting on one thigh. Place in the oven and roast for 45 minutes. Remove from oven, turn the turkey over so that it is resting on the other thigh, baste with the pan drippings and return to the oven for another 45 minutes. Remove from oven and turn the turkey right side up, with the breast topmost. Add one cup of chicken broth to the roasting pan. Using a wooden spatula, mix the broth with the drippings and baste. Return to the oven for one hour more, basting occasionally and adding more broth as necessary. The turkey should now be a deep golden brown. Remove it from the oven and allow it to sit for about 10 minutes before carving. While the turkey is resting, make the gravy: Add more broth to the roasting pan and stir with your spatula to mix the broth with the drippings. Taste and adjust the seasonings as necessary. Add the white wine, transfer to a small pot and heat through. Scoop the stuffing out of the turkey and place it in a small baking dish. If the stuffing looks dry, add a little gravy. Return it to the oven to keep it warm. Now you’re ready to carve the turkey. First remove the legs and wings, then carve the white meat. I generally serve the drumsticks whole but cut the meat off the thighs in order to have both white meat and dark meat on the platter. Place the stuffing on the platter, or serve in a separate dish. Spoon some gravy over the meat and the stuffing, and bring the rest of the sauce to the table. Bonne fête! Have a happy feast.